Last year I pedaled from Hartford to Minneapolis, MN with stops in many cities to visit community bicycle workshops like GObike Buffalo, Vulture Space, and DreamBikes (Milwaukee and Minneapolis). The ride was an adventure, but also research. How do these other cities and projects work? Does the city support the efforts? Are there bikes lanes and bike route networks? Who do the programs serve? To help understand a city (and bicycle project) in a city in deep fiscal trouble, I stopped in at The Hub of Detroit / Back Alley Bikes. My mom’s family hails from Detroit and participated largely in the white flight that stripped many of the city neighborhoods of middle income residents. During Detroit’s bankruptcy, my grandmother’s modest pension was decreased (5%) and her healthcare costs went up significantly. I wanted to better understand the project in Detroit for all sorts of reasons. 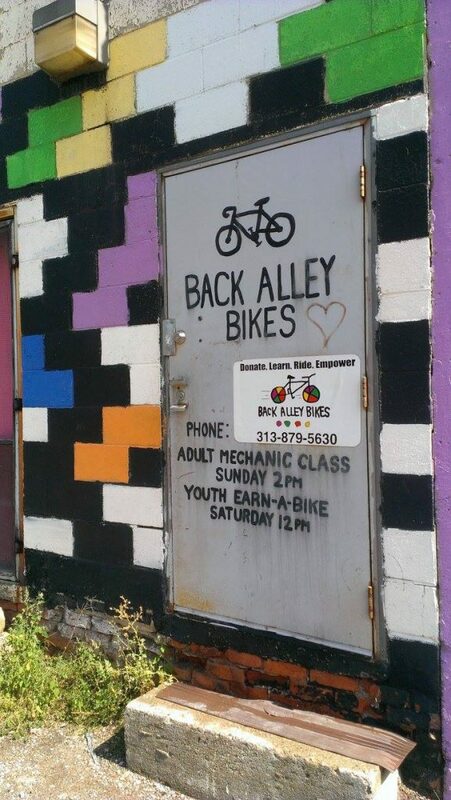 Back Alley Bikes started as a youth and community urban cycling program in 2000 with support from a local developer and non-profit. In 2008 the volunteer led programs transformed and grew to include the Hub of Detroit storefront social enterprise with paid staff. The storefront sales and service income supported the mechanics and sales employees and the community programs that continued with Back Alley Bikes. As the only bicycle shop in the area, the organization filled a gaping hole in the fabric of their city. While chatting with the staff at B-A-B, I recognized the pattern present in many successful bicycle programs – strong support from a non-profit or city combined with a community focused mission and low overhead costs. For example, GObike Buffalo occupies an entire retired police station with complimentary utilities. Cities and neighborhoods that invest in bicycle programs and infrastructure reap deep rewards as mode share increases for active transportation and the neighborhoods served benefit from low cost mobility and jobs access. Developers that are looking to spur vibrant urban communities benefit from having an organization like B-A-B (or BiCi Co.) in their district. As we look five years out, Hartford is staring at the specter of municipal bankruptcy. Although Detroit has its own unique set of factors, several structural financial issues are similar to what we find in Hartford. Heavy legacy costs and bond debt with limited revenue weigh heavily on Hartford’s finances. Having visited Detroit several times in the past five years, I have seen the light at the end of the tunnel in a city that can once again invest in projects and residents. Detroit has a massive footprint (143 square miles) that maintains a high overhead cost for utilities and services. Hartford has only 18 square miles of area, but over half of that is not taxable. What role does BiCi Co. and the Center for Latino Progress serve in our city during what may be a multiyear bankruptcy? How can our organization serve the needs of the community, help build family assets, and connect residents to jobs? What does the funding mix look like for both the Center and BiCi Co.? BiCi Co. gets very little support from the government (federal, state, or municipal), and by ramping up the social enterprise income we are well positioned to weather the financial storm in their respective budgets. As the only bicycle shop and bicycle repair storefront in the city, BiCi Co. is well positioned to convert that social enterprise income to community bicycle programs that support our current bicycle users and increase bicycle mode share as the city implements the Complete Streets ordinance with an inexpensive bicycle lane network that connects across the city. When I visited in 2016, Back Alley Bikes was again in transition. Through many years of programs, mechanic training, and building bicycle mode share the organization had spurred 3-4 additional private bicycle shops in Detroit with one just blocks away. The private competition was making it difficult to recruit mechanics, staff the storefront, and financially support their in-house bicycle community programs. From an outside perspective, B-A-B had succeeded in building a movement in Detroit that included many related jobs and increased access to bicycles and efficient urban mobility. The change in their business model (reduced retail and service income) is something we are keeping in mind at BiCi Co. as we look five to ten years into the future. BiCi Co.’s mission is to support jobs and economic development, but we know that along the way there will be competition and financial challenges that the BiCi Co. model needs to be innovative enough to weather. UConn’s Hartford campus brings new energy and visitors (and some residents) to the center of Hartford that will be interested in getting around without a car, or car-light. BiCi Co. already has a relationship with UConn Storrs (used bicycle donations) and is excited to support the sustainable, fun transportation needs of the Downtown campus students, staff, and professors. Looking ten years out, however the municipal insolvency resolves, we see a city and neighborhoods crisscrossed by a comfortable network of bicycle lanes – including connections to our near suburbs. The UConn energy and increased apartment developments and re-development of the industrial buildings around the Parkville CTfastrak station (transit oriented development) will likely support at least one independent bicycle shop in Hartford. BiCi Co. is working on our 10 year plan that is ready for additional shops to enter the scene and continue to build active transportation mode share in the city. A funding mix (grants, DIY membership, program funding, safety classes, etc) already provides more long term resiliency in the BiCi Co. than an organization that counts on only one program or funding source. Slow Roll to Farm to Street Happy Hour – June 24th. Meet up at 5pm at BiCi Co. (97 Park Street) We’ll roll over (in a roundabout way) to Bushnell Park and the Farm to Street event. Bicycling over gets us access to the pre-dinner happy hour and drinks. BiCi Co. teen interns will be staffing the bicycle valet parking at the event. We’ll see you there! All Aboard! – Thursday, June 29th. Learn more about increased commuter rail service in the New Haven, Hartford, and Springfield corridor. What does that mean for transit oriented development? 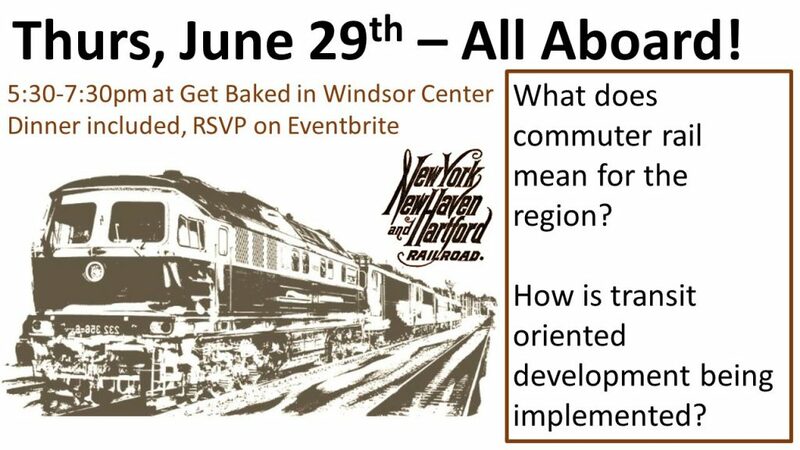 How does this impact town centers at transit nodes along the rail line and what is the benefit to the region? 5:30pm at Get Baked in Windsor Center. Organized by the Transport Hartford Academy, a program at the Center for Latino Progress. Trains are great for sustainable, multimodal transportation options. Ask about roll-aboard bikes on trains. Will that be a feature? Register here – needed to get headcount for food.